Depending on blowing the next bubble to temporarily prop up the economy is the height of foolhardy shortsightedness. 1. They focus on effects and symptoms rather than address the underlying causes, i.e. the dryrot at the heart of our government, society and economy. 2. They maintain and protect the Status Quo Powers That Be–no vested interests, protected fiefdoms or Financial Elites ever lose power as a result of these policy tweaks. 3. They are politically expedient, meaning they assuage the demands of vested interests rather than tackle the rot undermining the nation. 4. They ignore the perverse incentives built into current systems and the incentives of complicity, i.e. to cheer another coat of paint on the dryrot rather than face the costs of real reform. The financial underpinnings of the economy and society are rotting from within:finance, higher education, defense, healthcare, law, governance, you name it. This week I want to highlight a few key causes of this pervasive and eventually fatal systemic rot. Let’s start with Our Ponzi Economy. There are three primary examples of our Ponzi Economy: pay-as-you-go social programs (Social Security, Medicare, Medicaid, etc. ); housing and the stock market. All are examples of financial Ponzi schemes. All Ponzi schemes rely on an ever-expanding pool of greater fools who buy into the scheme and pay the interest/gains due the previous pool of greater fools. Ponzi schemes fail because the pool of greater fools is finite, but the scheme demands an ever-expanding pool of participants to function. All Ponzi schemes eventually fail, though each is declared financially soundbecause this time it’s different. The number of greater fools required to keep the scheme going eventually exceeds the working population of the nation. 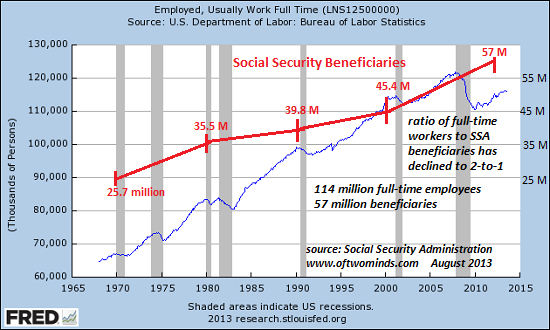 1 retiree consumes the taxes paid by 5 workers. Those 5 workers when they retire consume the taxes paid by 25 workers. Those 25 workers when they retire consume the taxes paid by 125 workers. Those 125 workers when they retire consume the taxes paid by 625 workers. Those 625 workers when they retire consume the taxes paid by 3,125 workers. You see where this goes: very quickly, the number of workers required to keep the Ponzi scheme afloat exceeds the entire workforce. The only way to keep the Ponzi scheme going is to keep raising payroll taxes on the remaining workers, which is precisely what welfare states (i.e. every developed economy on the planet) has done. 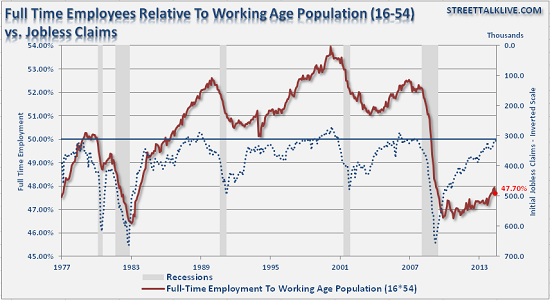 As the percentage of the working-age populace with full-time jobs declines, the worker-retiree ratio will become increasingly unsustainable. The taxes paid by each worker are nowhere enough to fund the generous pension and healthcare benefits promised to every retiree. In the U.S., the number of people of working age who are jobless is 92 million; the number of full-time jobs is 118 million. 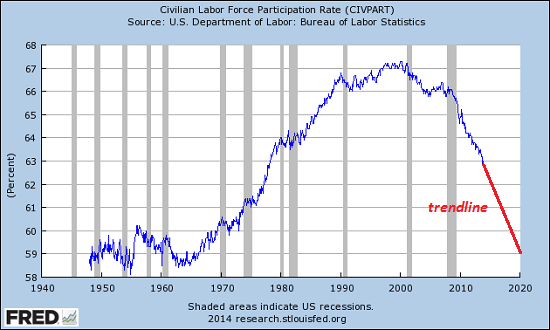 This chart of labor participation includes almost 30 million part-time employees who don’t earn enough to pay substantial taxes and millions of self-employed people making poverty-level net incomes. Housing is also a classic Ponzi scheme: prices can only go up if there is an ever-expanding pool of greater fools willing and able to pay even more for a house than the previous pool of greater fools. 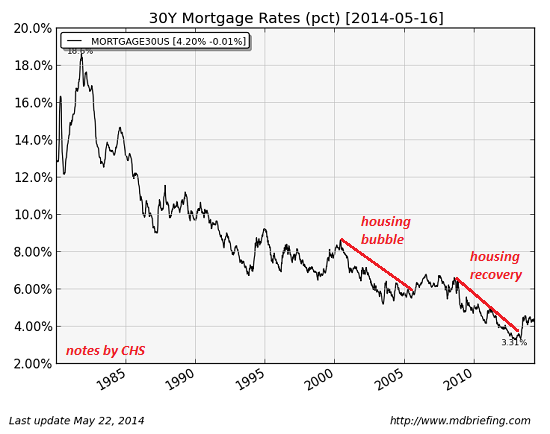 As I have explained many times, the only way the Status Quo has been able to expand the pool of greater fools is to lower interest rates to near-zero, drop down payments to 3% and loosen previously-prudent lending standards. The stock market has been made the official metric of the nation’s economic health; too bad it’s a Ponzi scheme. 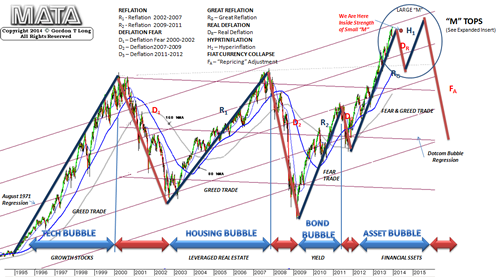 Financial bubbles are what economist Robert Shiller calls “naturally occurring Ponzis” because the psychology of ever-rising prices and profits fuels an inflow of greater fools that sustains the bubble until all available greater fools have sunk their cash and credit into the bubble. Depending on blowing the next bubble to temporarily prop up the economy is the height of foolhardy shortsightedness. Yet that’s our Status Quo, increasingly dependent on inflating bubbles to evince “economic strength” when the Ponzi paint will soon peel off the rotten wood of the real economy.